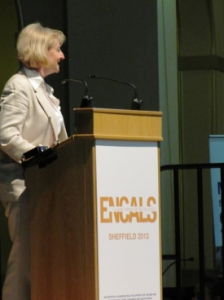 More than 200 international scientists and clinicians who are working to find a cure for the devastating neurodegenerative condition Motor Neurone Disease (MND) recently gathered at the Sheffield City Hall for the 11th annual meeting of the European Network for the Cure of Amyotrophic Lateral Sclerosis (ENCALS). Over 6,000 people in the UK suffer from Amyotrophic Lateral Sclerosis (ALS) also known as MND. The incurable disease destroys the cells which control movement causing progressive disability. Sufferers may lose their ability to walk, talk, eat and breathe, and at present treatment options for the protection of motor neurones have only a modest effect. More effective therapies are urgently needed. The Sheffield Institute for Translational Neuroscience directed by Professor Pam Shaw hosted the three day ENCALS event from Friday 31st May 2013 to Sunday 2nd June 2013 at the Sheffield City Hall. This important annual European meeting aims to bring together the key MND research groups to share their latest research and knowledge. This year’s meeting included two speakers who are renowned MND investigators from the USA, Professor Stanley Appel and Professor Clive Svendsen alongside Professor Pam Shaw and Dr Christopher McDermott from SITraN. 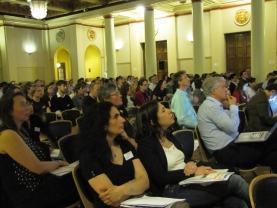 The world renowned event also provides an important platform for the next generation of MND researchers to present their work to leading international scientists. Dr Emily Goodall was amongst four investigators from SITraN showcasing her pioneering work. Dr Goodall’s research was motivated by the loss of her father to the condition 15 years ago. She added: “I hope my project will play a role in improving the diagnostic process for future families affected by MND, preventing the months of uncertainty we faced and helping them to get the support they need more quickly. During the meeting the ENCALS Young Investigator Award was presented to Dr Luc Dupuis from the University of Strasbourg in France. The award is presented to the early career researcher who has generated the most outstanding or innovative research in MND as judged by the panel. The meeting was a great success with over 30 oral presentations and 80 poster presentations over the three days and a lively debate regarding the value of genetic screening for MND patients and their families. The meeting delegates were also treated to a fantastic concert on the Friday evening by the 2CELLOS, Stjepan Hauser and Luka Sulic which also raised funds for MND research at SITraN. The organisers wish to acknowledge the kind support of the Motor Neurone Disease Association (MNDA), ResMed UK Ltd, Biogen Idec, Vertex, Informa Healthcare and Cytokinectics Inc for the meeting.